Women’s empowerment activist Nani Zulminarni had a few reasons to be angry in the late 1990s. Her marriage broke down, her husband married another woman, and to top it off, she was discriminated against at work for being a divorcee. So she resigned from her job as the director of the Center for Women’s Resources Development (PPSW). But when one door closes, another one opens. And sure enough, in 2001, Kamala Chandrakirana, the head of the National Commission on Violence Against Woman (Komnas Perempuan), asked Nani to work on a project documenting widows in conflict areas, starting in Aceh. The project morphed into a comprehensive program she is now heading called Pekka, or Women-Headed Household Empowerment. Nani successfully turned her anger into a relentless source of energy for the next decade, helping women who are the sole breadwinners in the household — widows, women abandoned by their husbands, and unmarried women who have dependants — organize themselves into self-reliant groups. These women, who just like Nani carried the burden of providing for a family without a husband, were at the bottom of the system, Nani explained. It is for this work that Nani received the Saparinah Sadli award last month. The award, named after the 83-year-old feminist scholar who founded Indonesia’s first women’s studies program at the University of Indonesia, is given to women who play an influential role in empowering women. More than 1,000 Pekka self-reliant groups of women have mushroomed across eight provinces, with the program reaching 10,000 families. Pekka is planning to create groups in nine more provinces in Indonesia. 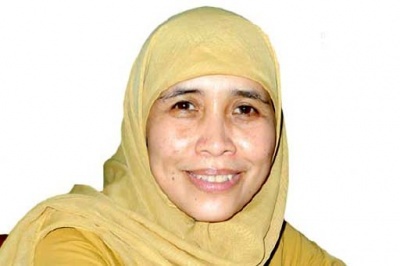 Sitting in her office in East Jakarta, Nani said she felt the award was an acknowledgement of the struggle of thousands of widows in Indonesia. According to the 2007 National Economics Census, 6 million households in Indonesia are headed by women, covering more than 30 million citizens. Nani explained households headed by women were generally poor and in many cases, the poorest among the poor in Indonesia. Women joining the program are usually between 20 to 60 years old, more than 38.8 percent are illiterate and have never received formal education. They have up to six dependents and mostly work as farm laborers or in other informal sectors including small trade. Upon joining, they usually earn less than one US dollar per day. For Nani, Pekka has been a spiritual journey that helped her find the meaning of her life. When she started Pekka, she was at the lowest point of her life. “Pekka is a healing process. That’s why it feels like I didn’t fight for other people [but I fought for myself],” she said. The incredible spirit of Pekka women constantly facing hardship inspired her, she went on. As part of her work empowering women economically and socially, Nina trained Pekka members to save up for business ventures, and taught them the basics of micro-financing. Financial aid, provided by Pekka and funded by the Japanese government through a World Bank trust fund, was channeled through a government program at the district level. “We made sure the money was not embezzled,” Nani said. It was hard work to train the women at first, Nani said, as many of them had never finished school. “At the beginning [of the training], members would sometimes write Rp 100,000 with four zeroes,” she said. The training, estimated to run for a year, was carried out over 18 months. Some groups were very successful, with one growing its capital from Rp 50 million to Rp 300 million. She explained discrimination toward women stemmed from people’s interpretation of religious texts, which places the woman as a subordinate and defines how good women should behave. Women in today’s society are still brought up to be wives, she said. “Ask any parent in any part of Indonesia. They will be ashamed if their daughter does not marry,” she said, adding that if a marriage ended, society still blamed the woman. Nani recalled suffering from discrimination on several occasions. During her divorce trial, for instance, the judges stated she was to blame for her husband remarrying. During a meeting with women in Aceh, a village leader asked her how she could organize Pekka if she couldn’t hold a marriage together. Nani believes there should be a new way of interpreting religious text that is more egalitarian. She said women should have choices and be able to make smart decisions in life.